Leave a professional, lasting impression with the D20 Disc Publisher from Imation. This easy to use CD/DVD publishing solution features a compact, professional design that fits right on your desktop. With a capacity of up to 20 discs, it automatically duplicates and prints brilliant direct-to-disc inkjet graphics on any standard inkjet printable discs. Deliver optimal image quality and color in concert with Imation Printable discs. 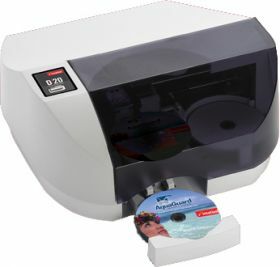 Quick setup ensures you’ll be burning and printing discs in minutes with the included easy to use software. The D20 Disc Publisher combined with Imation Printable discs, ink and image creation software ensures maximum design flexibility, brilliant colors from hub to edge, and quick drying graphics that resist smearing when exposed to water or humid conditions.